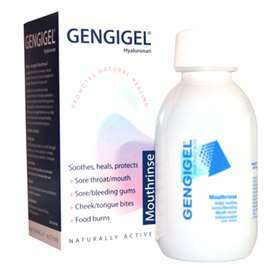 Gengigel Mouth Rinse is a natural and gentle treatment for the symptoms of gum irritation and Gingivitis. Gengigel helps to combat bleeding gums, sore or damaged tissue and tooth extraction sites. The gentle mouth wash helps to soothe inflammation and speed up the healing process. 150ml mouth wash with measuring cup. The main ingredient in Gengigel, Hyaluronan, is an element naturally found in the body's connective tissues. In the gums, Hyaluronan acts as a barrier and repairs any damage the gums are submitted to. The Hyaluronan in the mouthrinse, resembles that of the Hyaluronan found in the gums. The high concentration, will help to soothe and repair the damage. Gengigel works to heal gums that are damaged, bleeding, aggravated or recovering from dental work. These aggravations can be caused by gingivitis, dental work, abrasion or tooth removal. Gengigel can also benefit those with periodontal disease as the Hyaluronan helps with cell renewal to regenerate tissue. You can also use Gengigel can be used long term to maintain healthy gums and tissues. Brush your teeth before you use Gengigel Mouth Rinse. Rinse out mouth 3 or 4 times a day for 3-4 weeks. Try to avoid eating or drinking anything for at least 30 minutes after use. Gengigel is completely safe for all to use. It has no contraindications or side effects and can be used without restriction. Gengigel will work for children, the elderly, diabetics and women pregnant or breast feeding. It can also be used along side other medicines or therapies. Hyaluronan 25mg • Xylitol • Excipients (An easily absorbed carrier).